Habit: Annual, biennial, cespitose or with stolons, 0.2--2 dm. Leaf: sheath open +- 2/3 length; ligule 1--5 mm, rounded to obtuse; blade generally 1--3 mm wide, soft, generally flat, bright- or yellow-green. Inflorescence: 1--10 cm, triangular, 1.2--1.6 × longer than wide, open in fruit; branches spreading, smooth, with spikelets only in top 1/2. Spikelet: axis +- hidden; callus glabrous; lemma 2.5--4 mm, smooth, veins soft-hairy or glabrous; palea keels hairy. Flower: bisexual or upper 1--2 pistillate; anther 0.6--1 mm. Chromosomes: 2n=28. 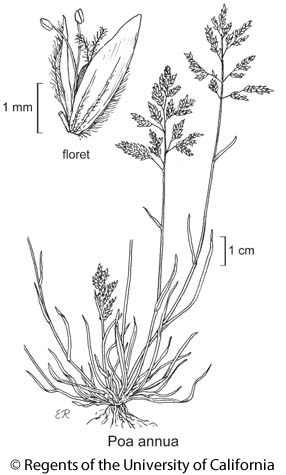 Citation for this treatment: Robert J. Soreng 2012, Poa annua, in Jepson Flora Project (eds.) Jepson eFlora, http://ucjeps.berkeley.edu/eflora/eflora_display.php?tid=38787, accessed on April 19, 2019. CA (esp near coast); Markers link to CCH specimen records. Yellow markers indicate records that may provide evidence for eFlora range revision or may have georeferencing or identification issues. Purple markers indicate specimens collected from a garden, greenhouse, or other non-wild location.